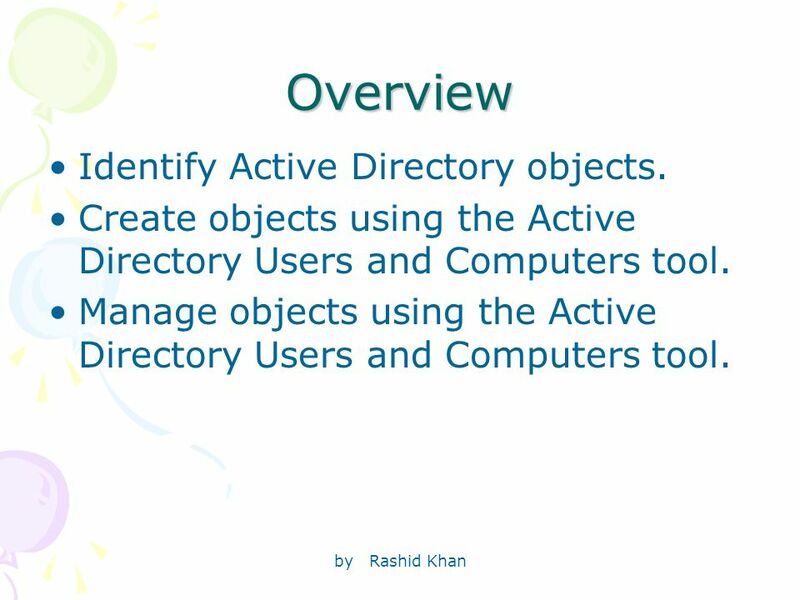 By Rashid Khan Lesson 5-Directory Assistance: Administration Using Active Directory Users and Computers. 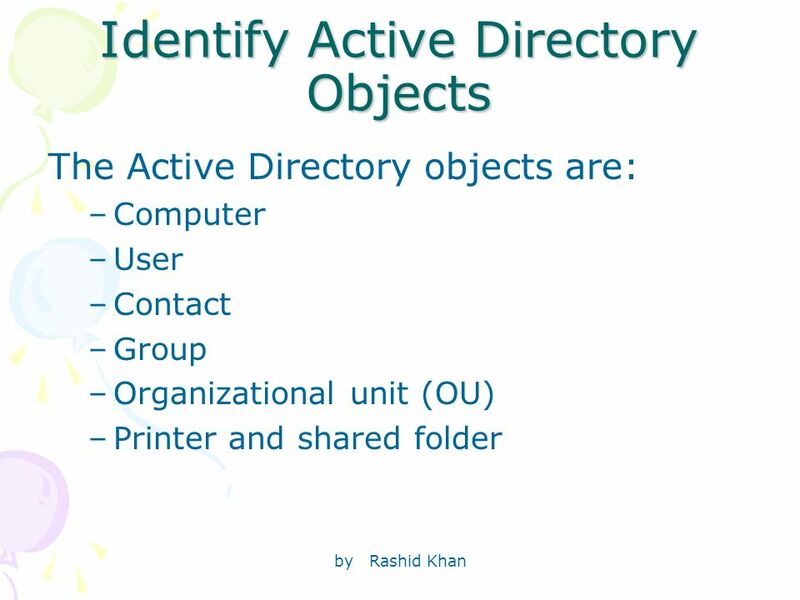 2 by Rashid Khan Overview Identify Active Directory objects. Create objects using the Active Directory Users and Computers tool. 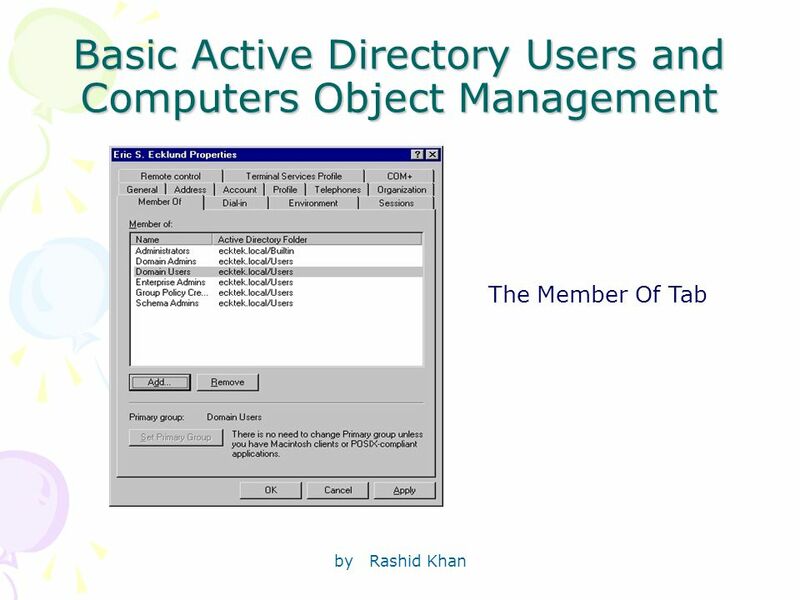 Manage objects using the Active Directory Users and Computers tool. 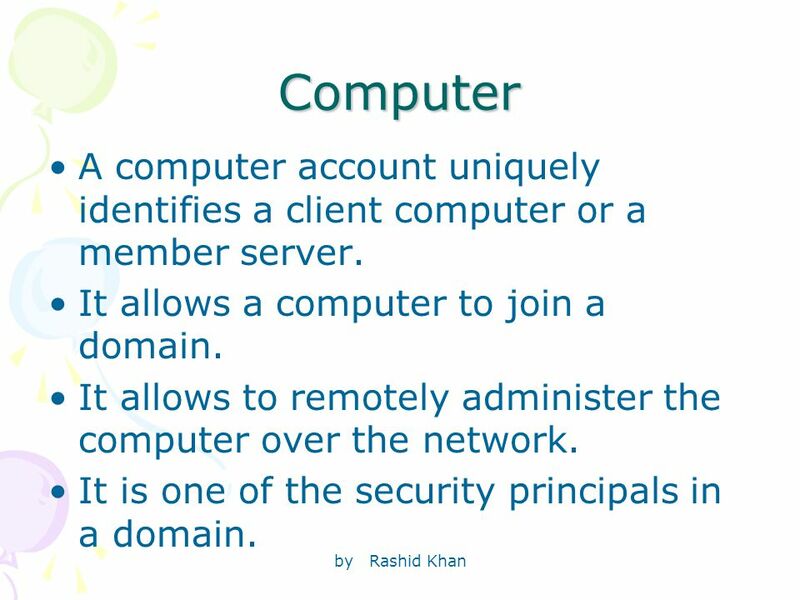 4 by Rashid Khan Computer A computer account uniquely identifies a client computer or a member server. It allows a computer to join a domain. It allows to remotely administer the computer over the network. It is one of the security principals in a domain. 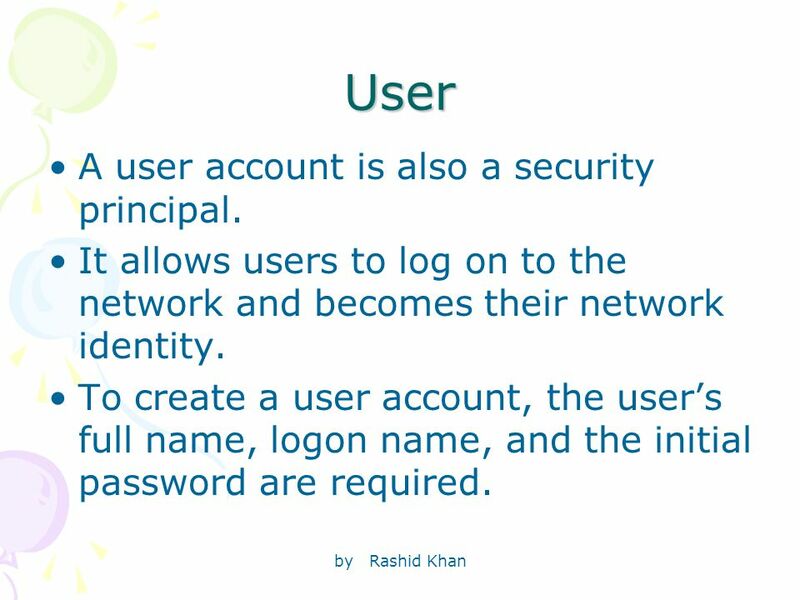 5 by Rashid Khan User A user account is also a security principal. It allows users to log on to the network and becomes their network identity. To create a user account, the user’s full name, logon name, and the initial password are required. 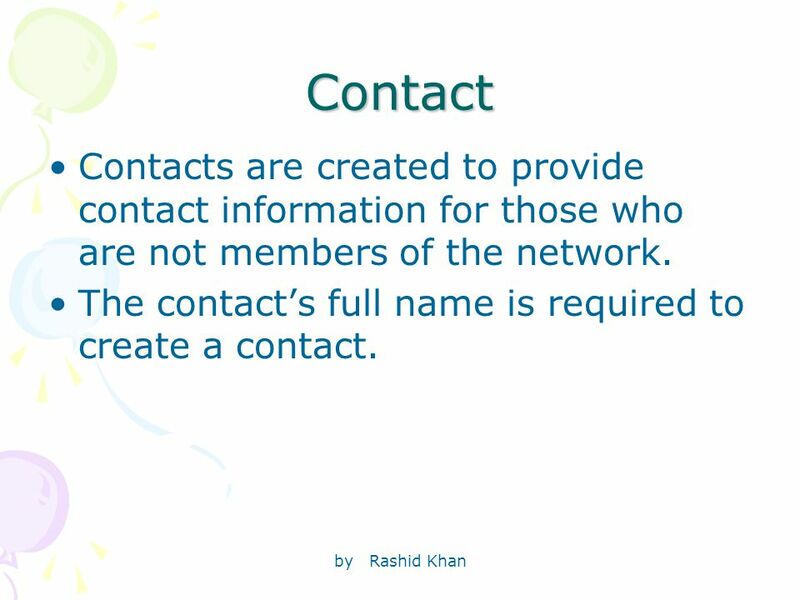 6 by Rashid Khan Contact Contacts are created to provide contact information for those who are not members of the network. The contact’s full name is required to create a contact. 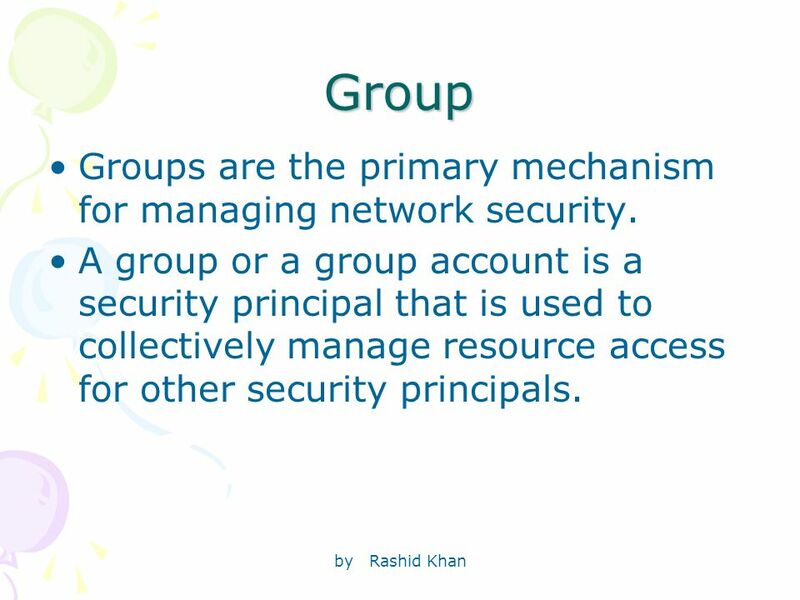 7 by Rashid Khan Group Groups are the primary mechanism for managing network security. A group or a group account is a security principal that is used to collectively manage resource access for other security principals. 8 by Rashid Khan Group Groups can be referred to as distribution and security groups. The different types of security groups have different group scopes. The group scope provides access to resources at different levels within the overall logical network. 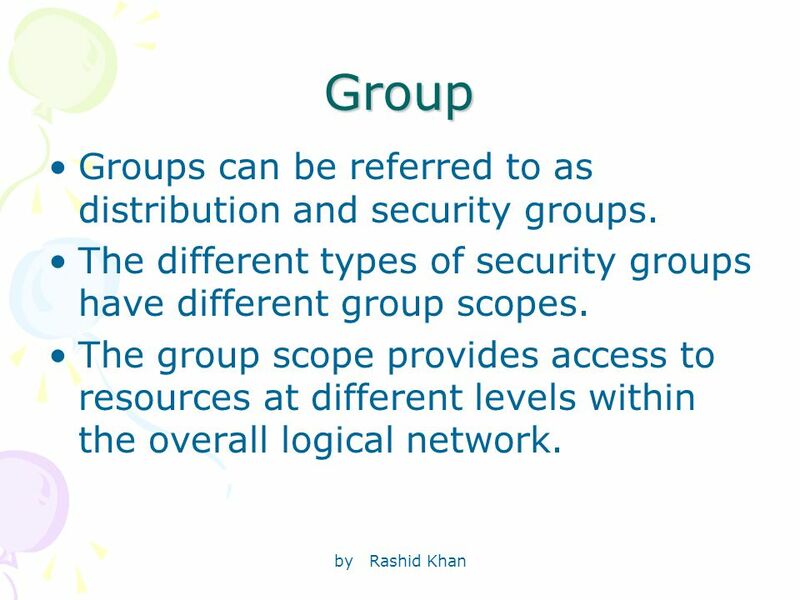 9 by Rashid Khan Group The three types of security groups are: –Domain local groups – Can be given permissions for the domain in which they were created. –Global groups – Can become members of a group in other trusted domains. –Universal groups – Can be given permissions throughout all trusted domains, without having to join any other group. 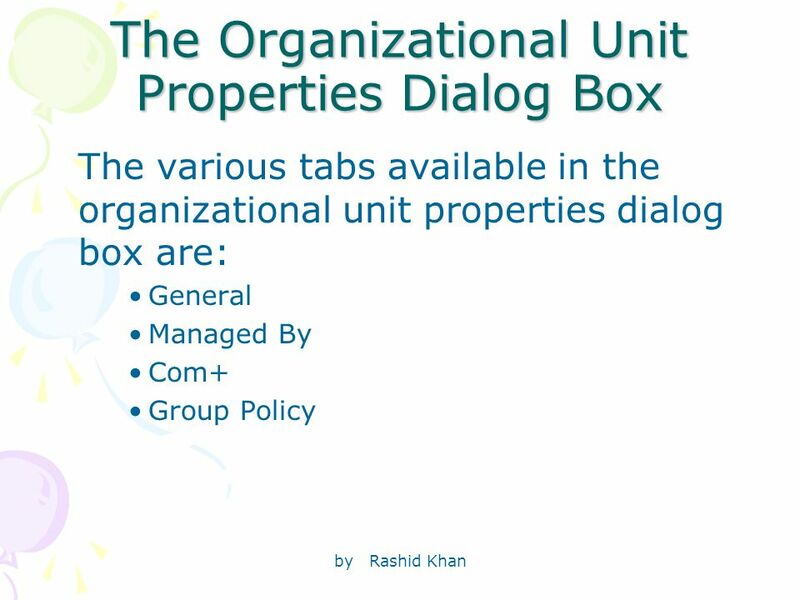 10 by Rashid Khan Organizational Unit OUs: –Are used to subdivide a domain into manageable segments. This helps organize the network. –Help administrators to delegate administrative tasks of the OU to other users. 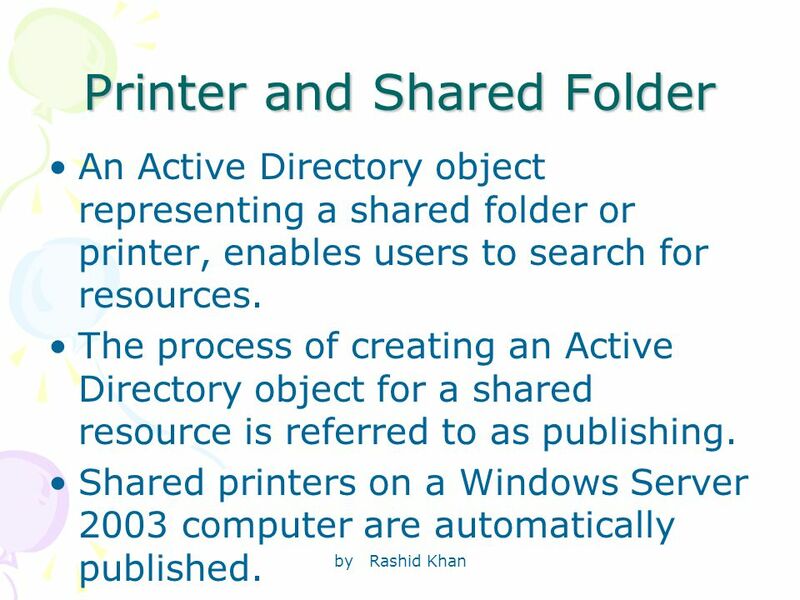 11 by Rashid Khan Printer and Shared Folder An Active Directory object representing a shared folder or printer, enables users to search for resources. The process of creating an Active Directory object for a shared resource is referred to as publishing. Shared printers on a Windows Server 2003 computer are automatically published. 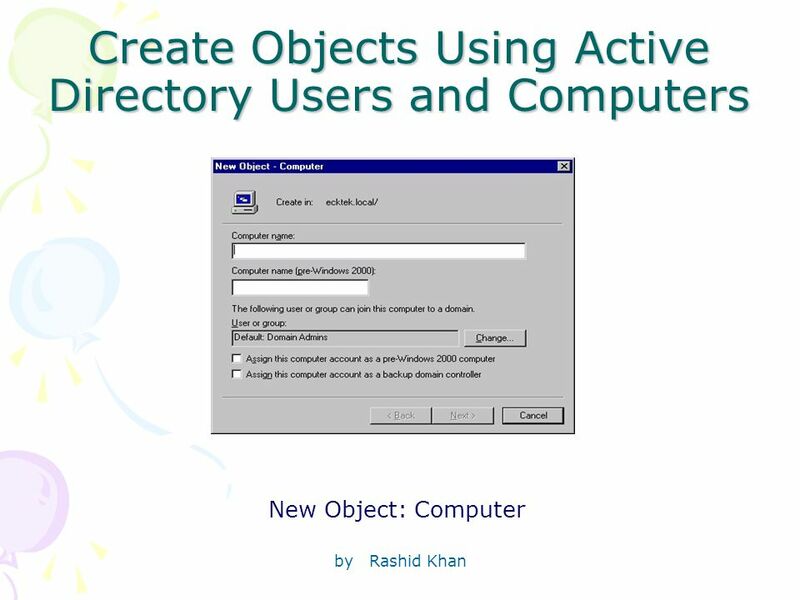 12 by Rashid Khan Create Objects Using Active Directory Users and Computers The Active Directory Users and Computer interface. 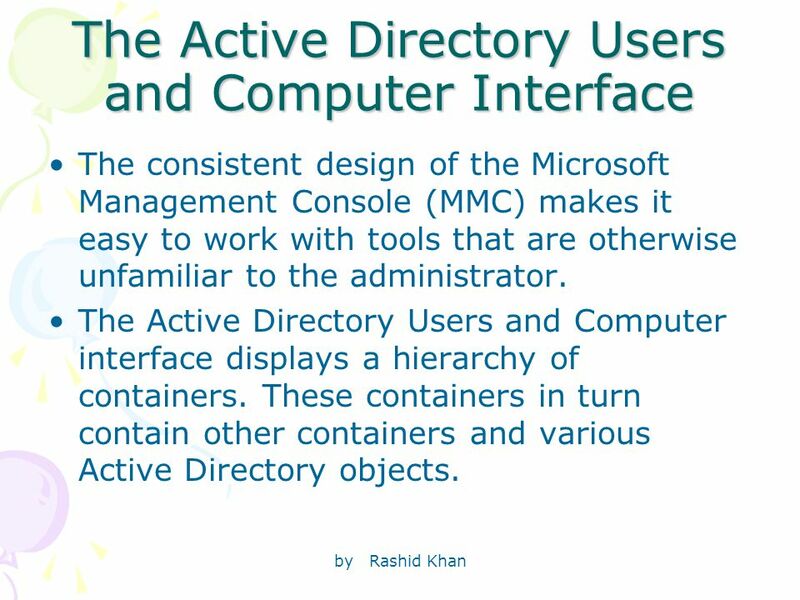 The initial Active Directory containers and objects. 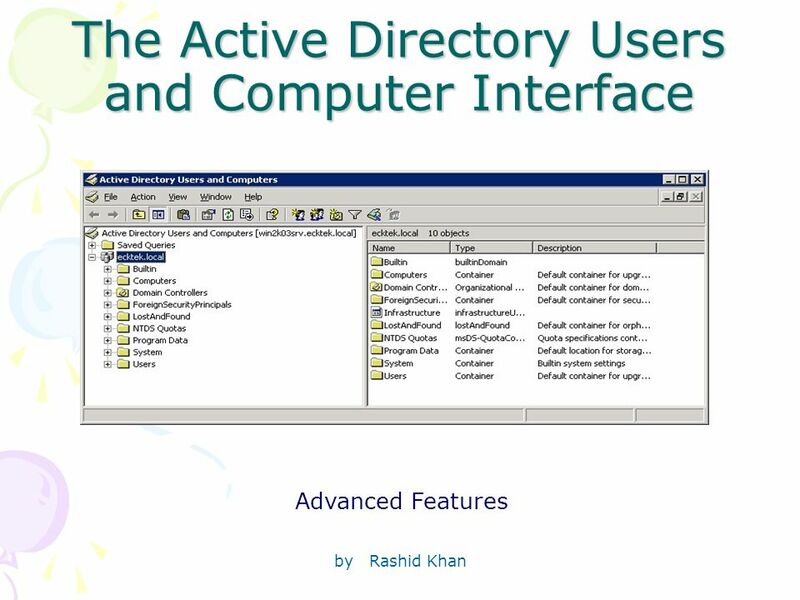 13 by Rashid Khan The Active Directory Users and Computer Interface The consistent design of the Microsoft Management Console (MMC) makes it easy to work with tools that are otherwise unfamiliar to the administrator. 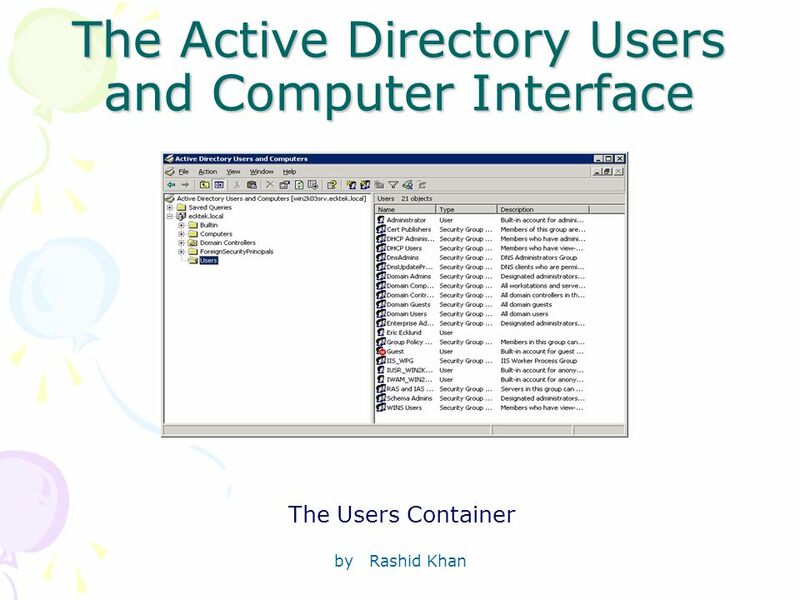 The Active Directory Users and Computer interface displays a hierarchy of containers. 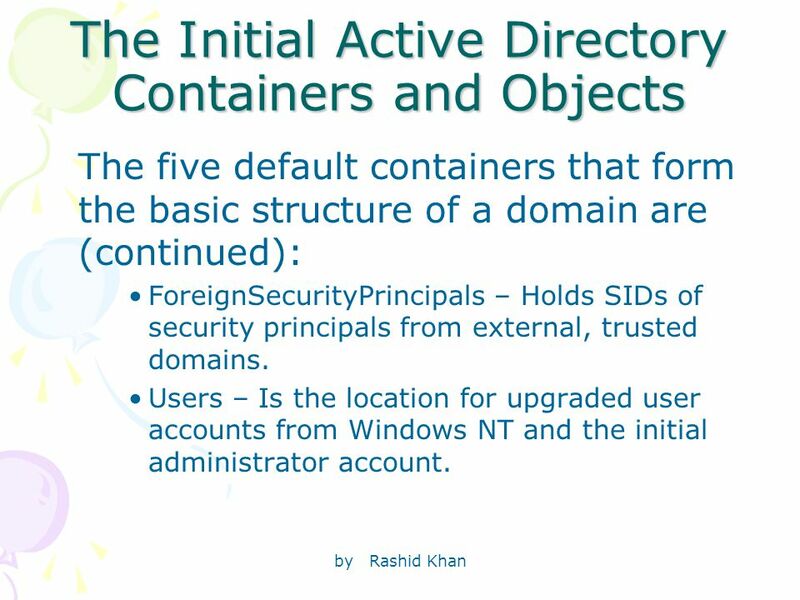 These containers in turn contain other containers and various Active Directory objects. 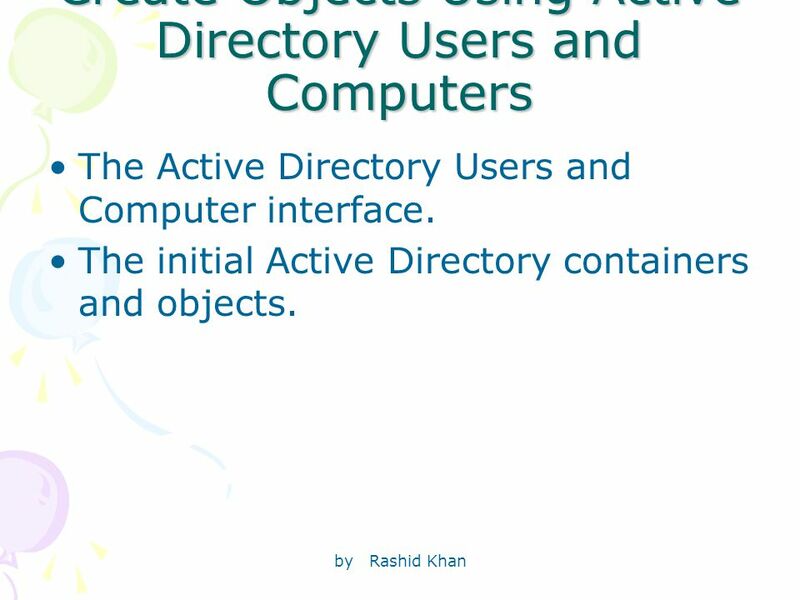 19 by Rashid Khan The Initial Active Directory Containers and Objects The five default containers that form the basic structure of a domain are: Builtin – Contains the security groups included with the installation of Active Directory. 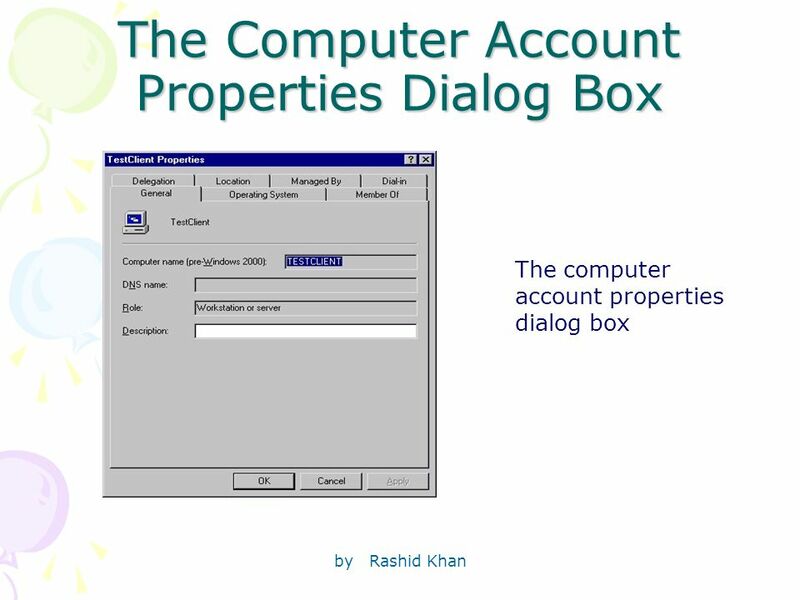 Computers – Is the default location for upgraded computer accounts from previous network operating systems such as Windows NT. 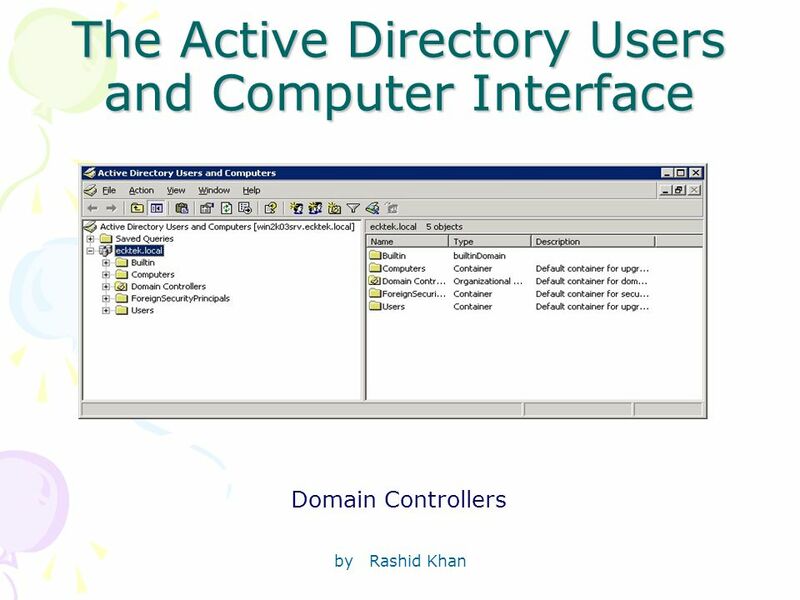 Domain Controllers (DCs) – Contains DCs for the domain that can be used to apply security policies to OUs. 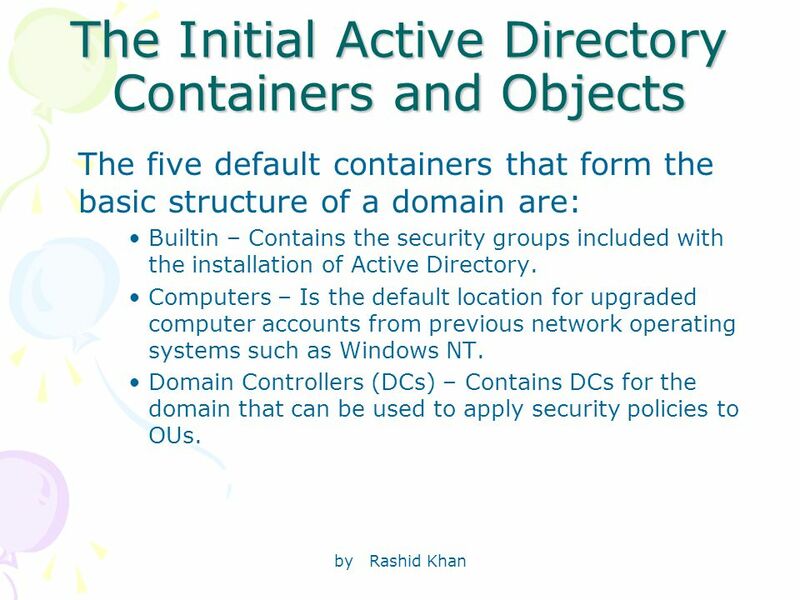 20 by Rashid Khan The Initial Active Directory Containers and Objects The five default containers that form the basic structure of a domain are (continued): ForeignSecurityPrincipals – Holds SIDs of security principals from external, trusted domains. 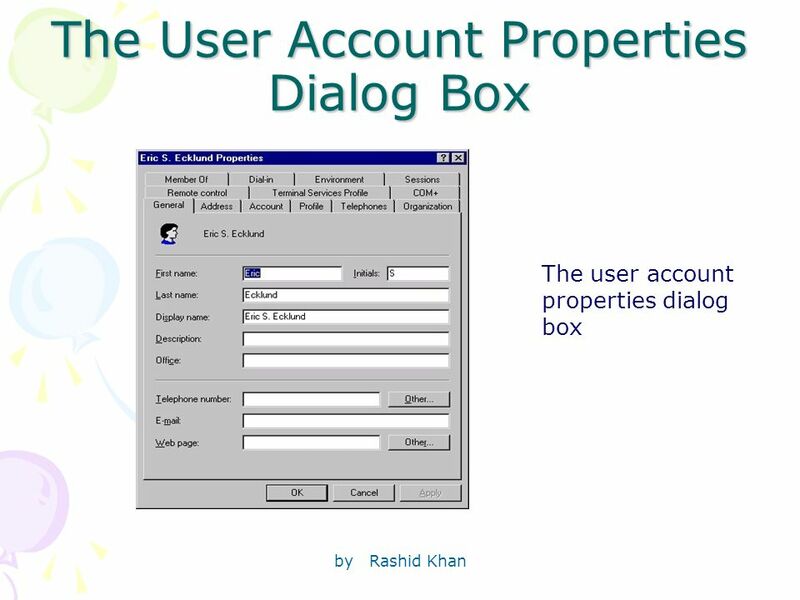 Users – Is the location for upgraded user accounts from Windows NT and the initial administrator account. 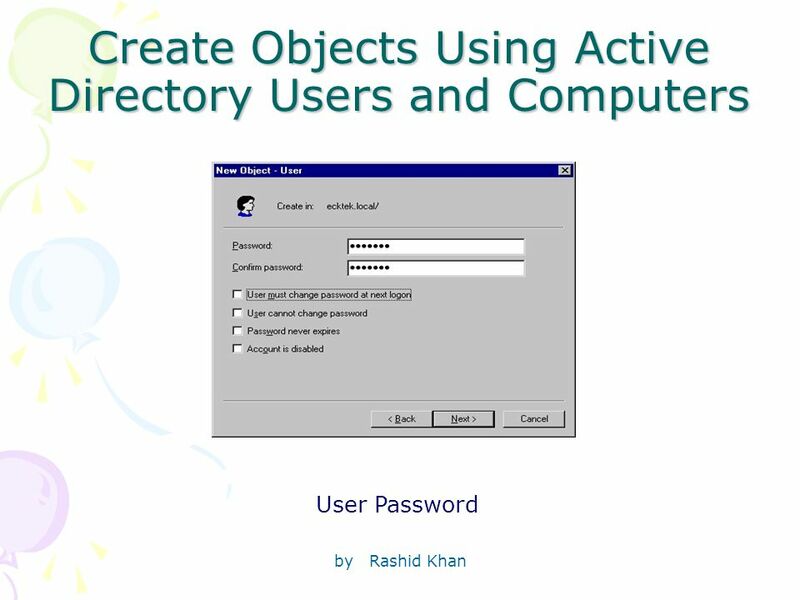 21 by Rashid Khan Create Objects Using Active Directory Users and Computers Computer and user accounts are the most frequently created Active Directory objects. The OUs may not be created as frequently, but they should be planned properly before creation. 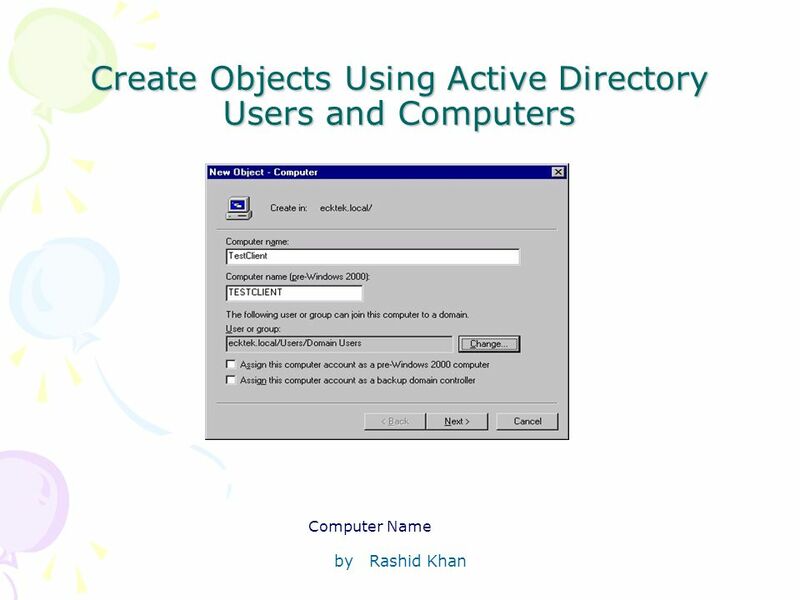 27 by Rashid Khan Manage Objects Using Active Directory Users and Computers Object properties. 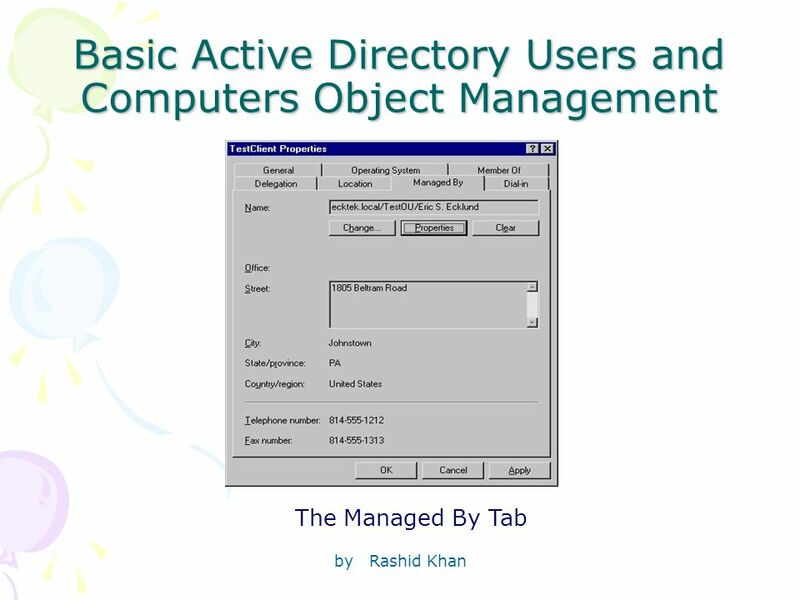 Basic Active Directory Users and Computers object management. 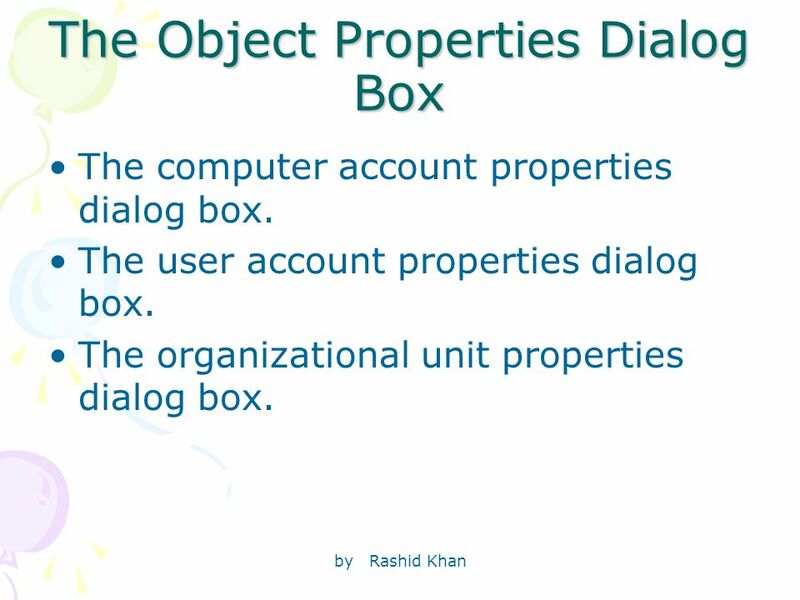 28 by Rashid Khan The Object Properties Dialog Box The computer account properties dialog box. 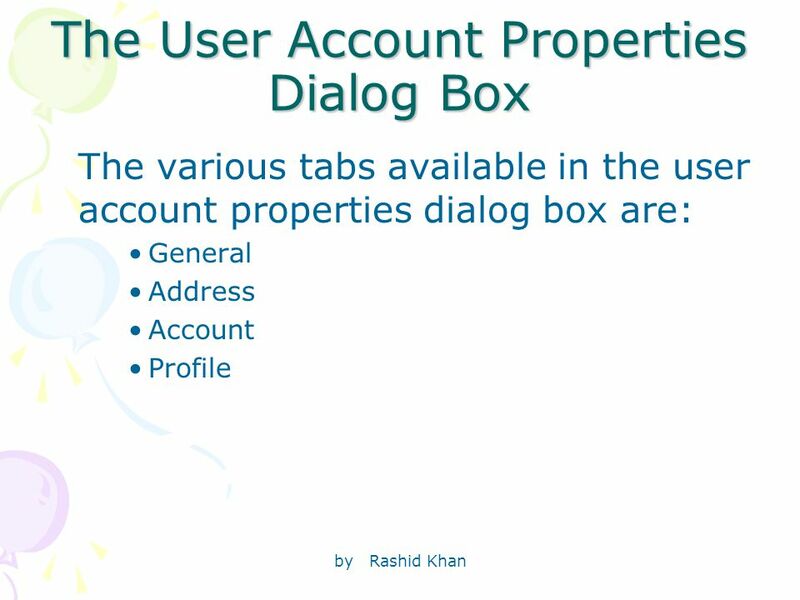 The user account properties dialog box. 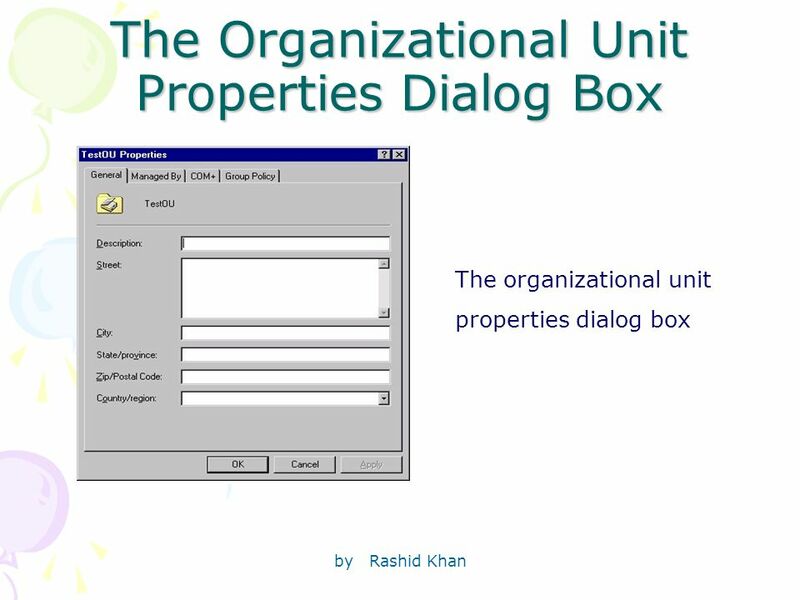 The organizational unit properties dialog box. 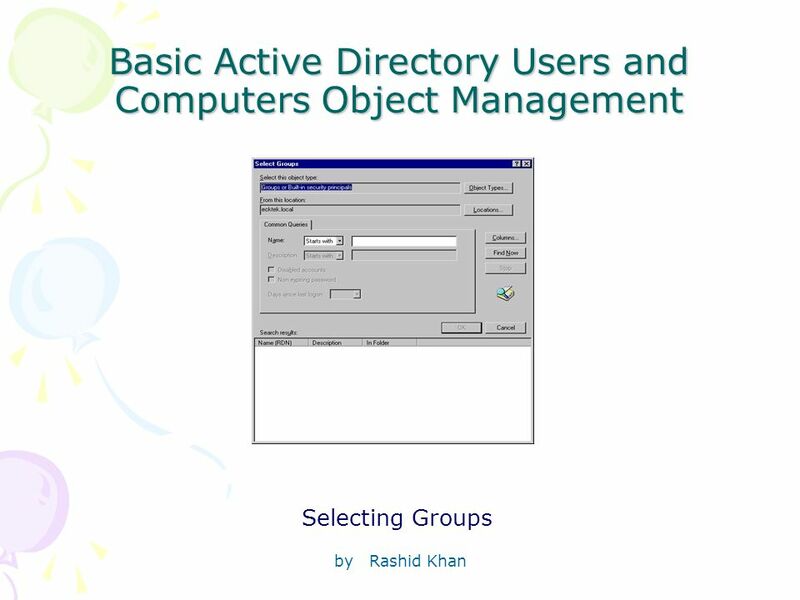 38 by Rashid Khan Basic Active Directory Users and Computers Object Management Managing the basic Active Directory Users and Computers involves moving and editing the objects. 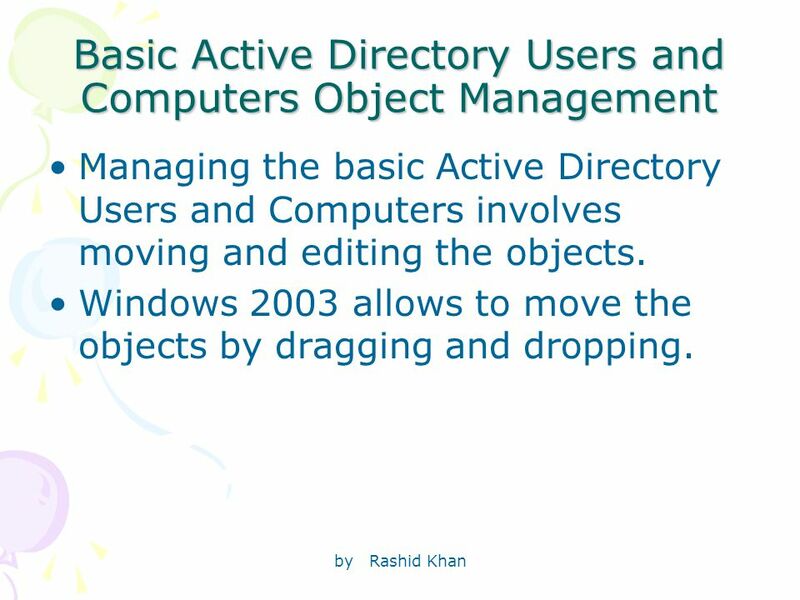 Windows 2003 allows to move the objects by dragging and dropping. 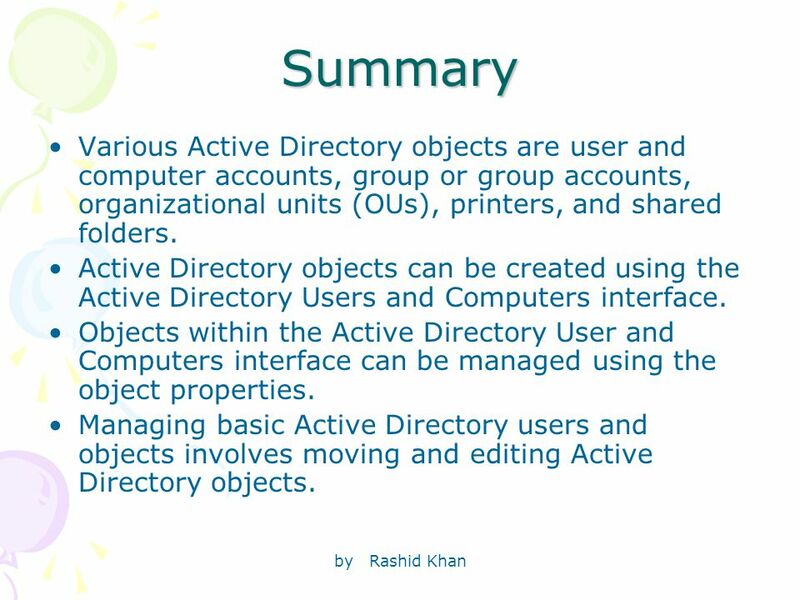 44 by Rashid KhanSummary Various Active Directory objects are user and computer accounts, group or group accounts, organizational units (OUs), printers, and shared folders. 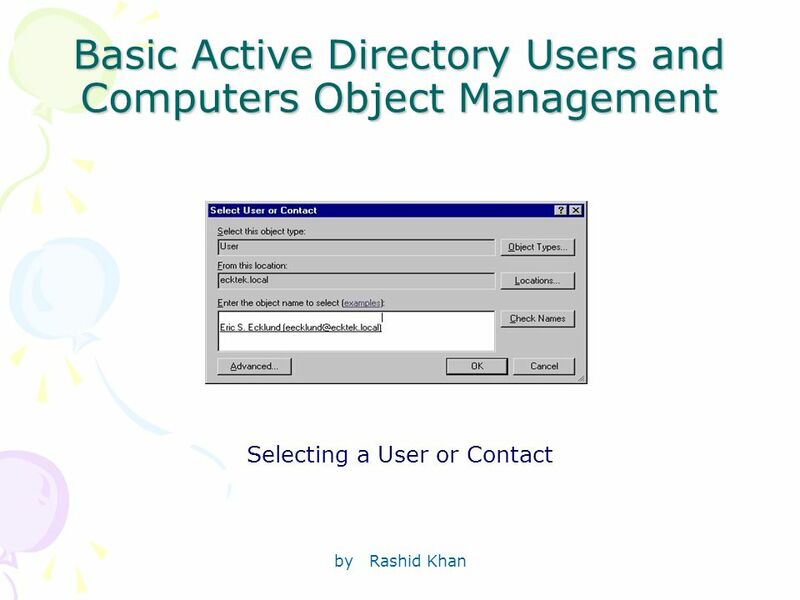 Active Directory objects can be created using the Active Directory Users and Computers interface. 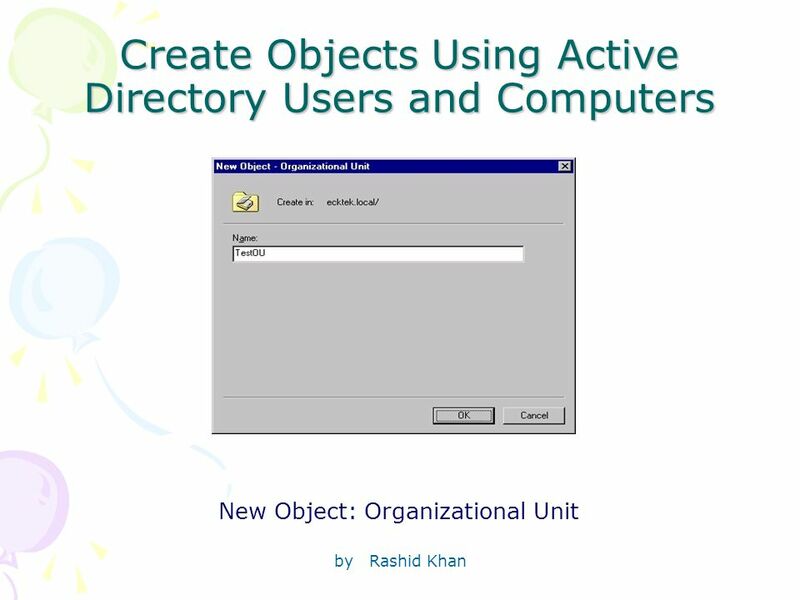 Objects within the Active Directory User and Computers interface can be managed using the object properties. 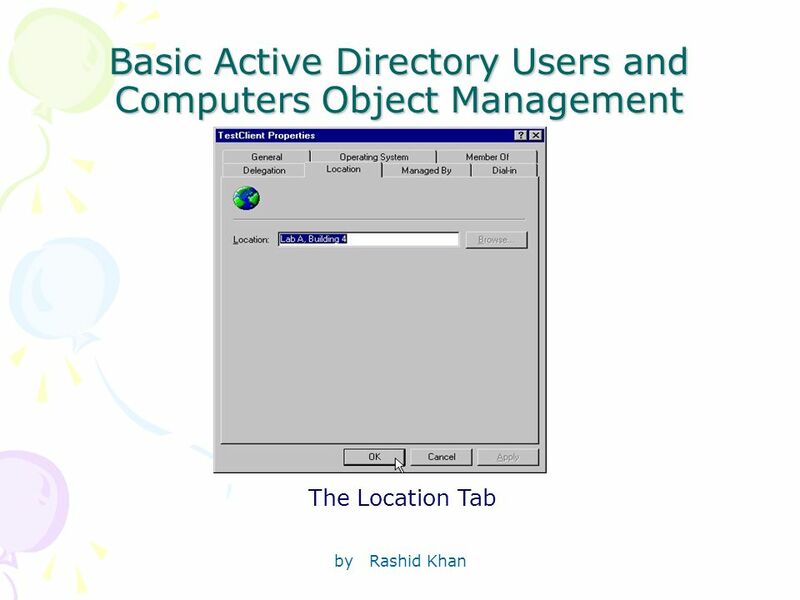 Managing basic Active Directory users and objects involves moving and editing Active Directory objects. 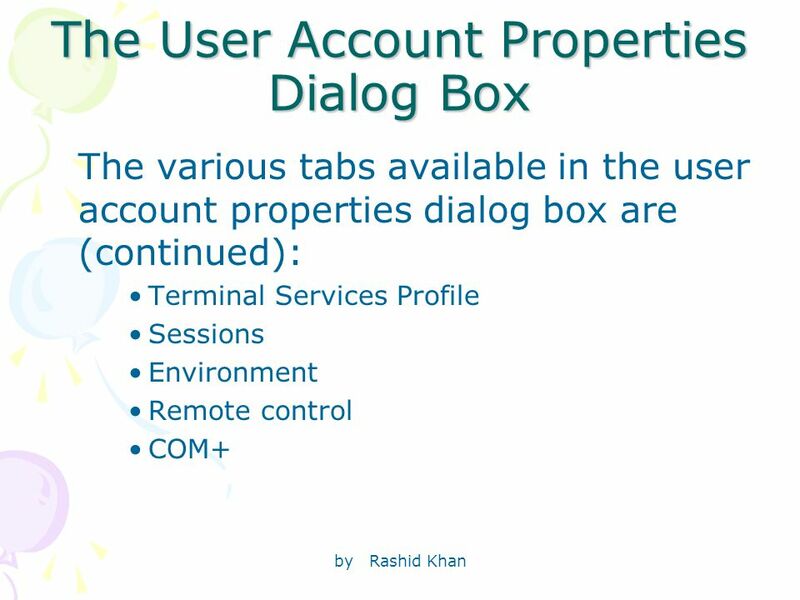 Download ppt "By Rashid Khan Lesson 5-Directory Assistance: Administration Using Active Directory Users and Computers." Chapter Five Users, Groups, Profiles, and Policies. 15.1 © 2004 Pearson Education, Inc. Exam Managing and Maintaining a Microsoft® Windows® Server 2003 Environment Lesson 15: Configuring a Windows. 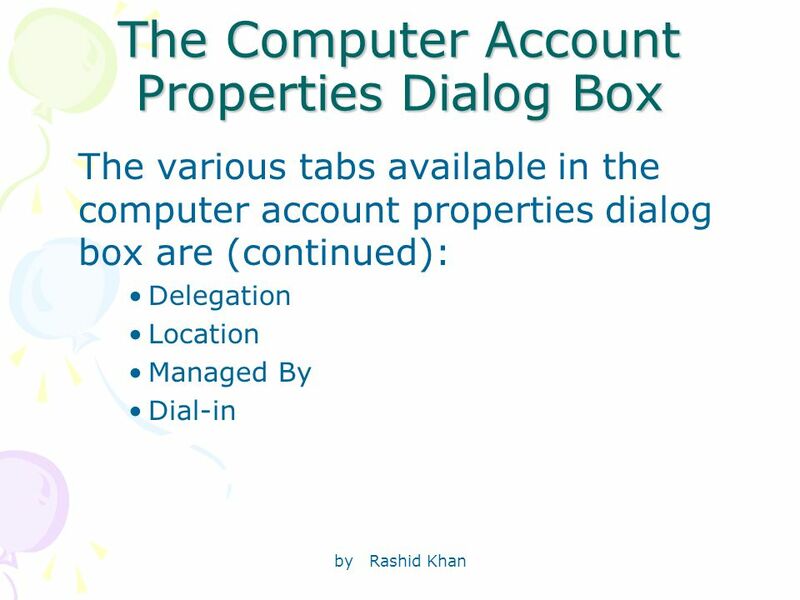 Khan Rashid Lesson 11-The Best Policy: Managing Computers and Users Through Group Policy. 7.1 © 2004 Pearson Education, Inc. 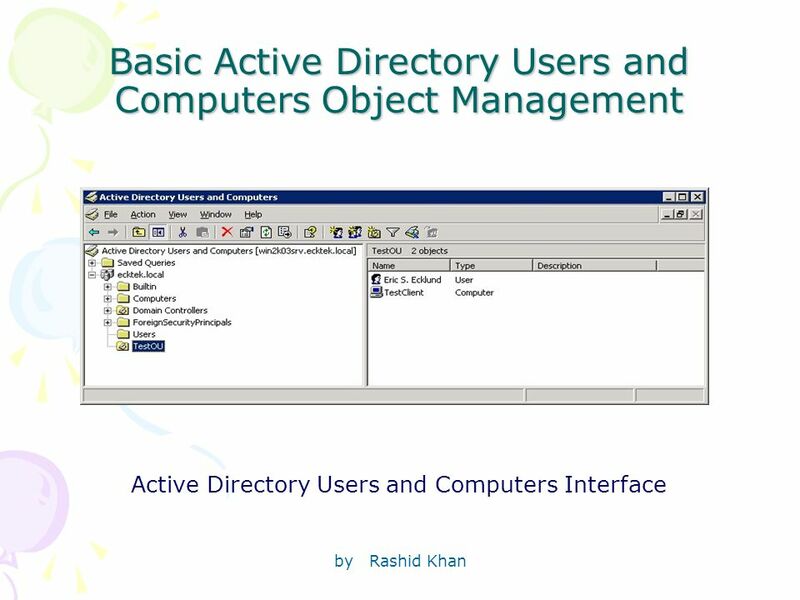 Exam Planning, Implementing, and Maintaining a Microsoft Windows Server 2003 Active Directory Infrastructure. 6.1 © 2004 Pearson Education, Inc. Exam Planning, Implementing, and Maintaining a Microsoft Windows Server 2003 Active Directory Infrastructure. 3.1 © 2004 Pearson Education, Inc. 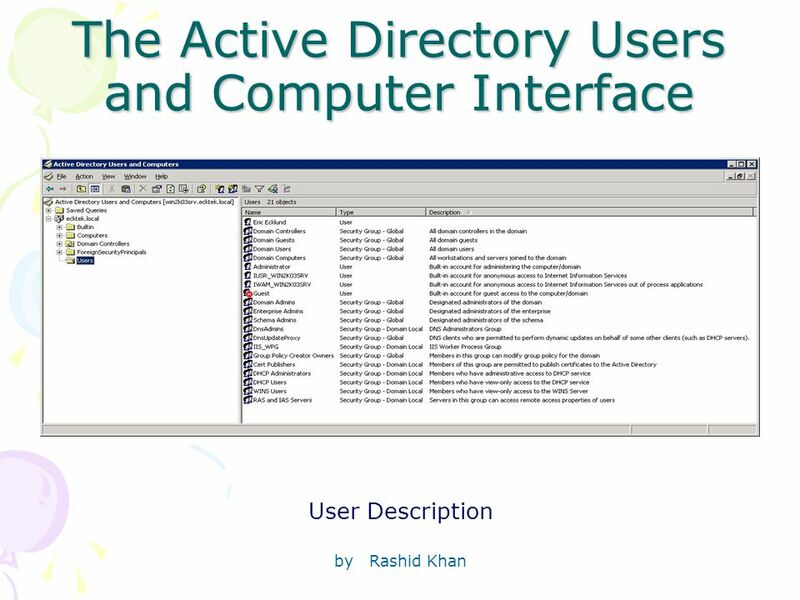 Exam Managing and Maintaining a Microsoft® Windows® Server 2003 Environment Lesson 3: Introducing Active Directory. 15.1 © 2004 Pearson Education, Inc. Exam Planning, Implementing, and Maintaining a Microsoft® Windows® Server 2003 Active Directory Infrastructure. 70-290: MCSE Guide to Managing a Microsoft Windows Server 2003 Environment Chapter 1: Introduction to Windows Server 2003. 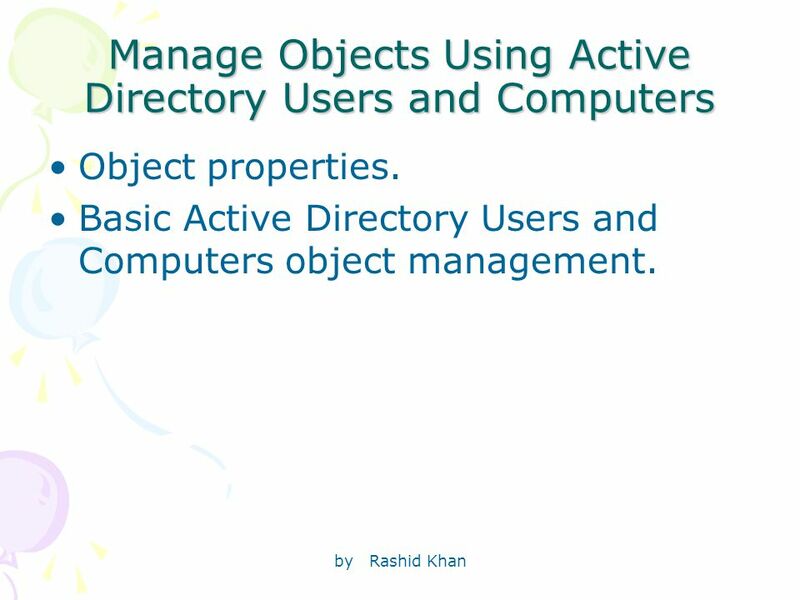 1 Chapter 1 Introduction to Windows Server Two main goals for Net Admin Make network resources available to users Files, folders, printers, etc. 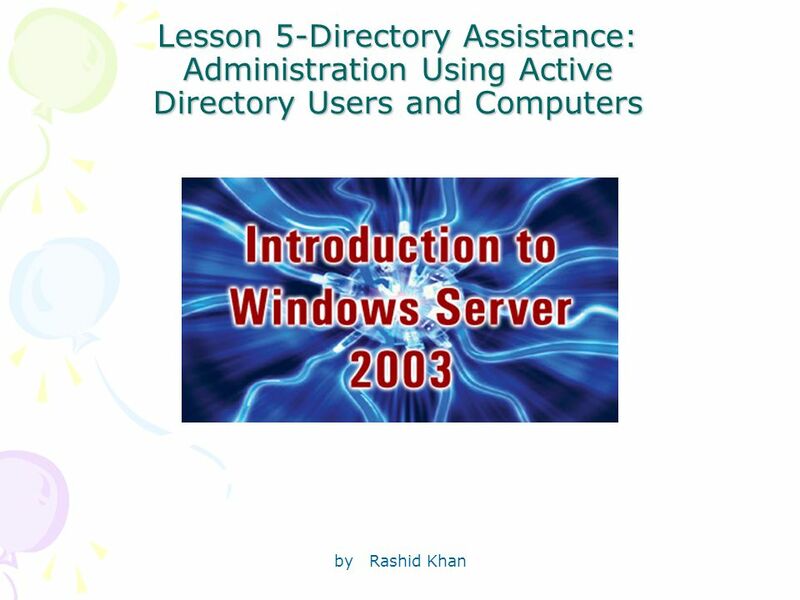 By Rashid Khan Lesson 4-Preparing to Serve: Understanding Microsoft Networking. 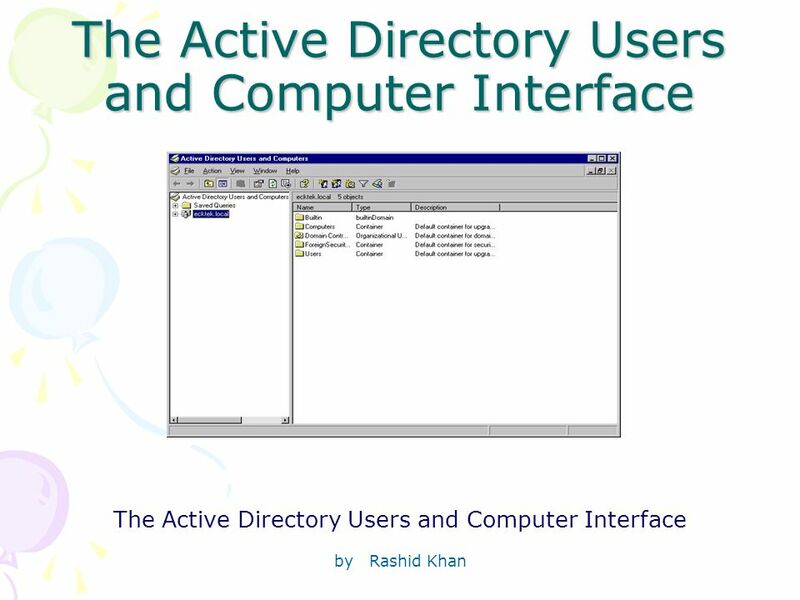 Hands-On Microsoft Windows Server 2003 Administration Chapter 3 Administering Active Directory. 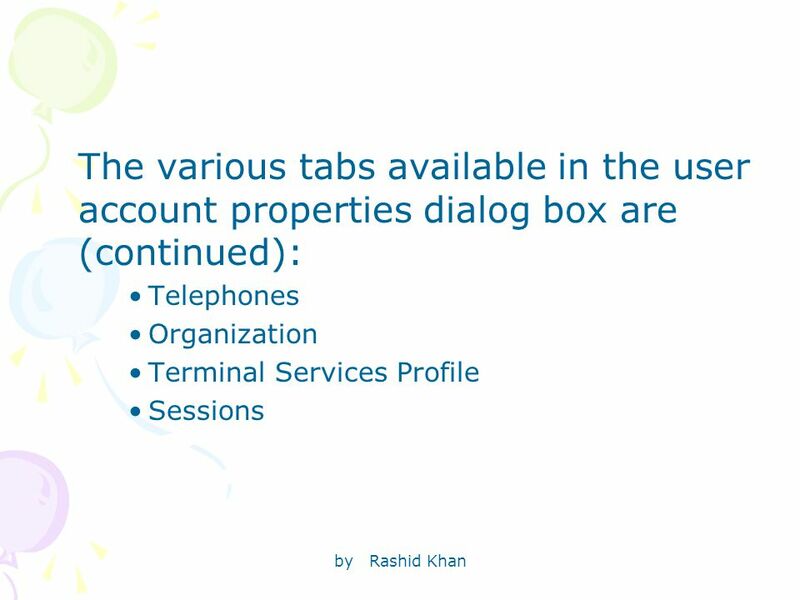 By Rashid Khan Lesson 8-Crowd Control: Controlling Access to Resources Using Groups. 7.1 © 2004 Pearson Education, Inc. 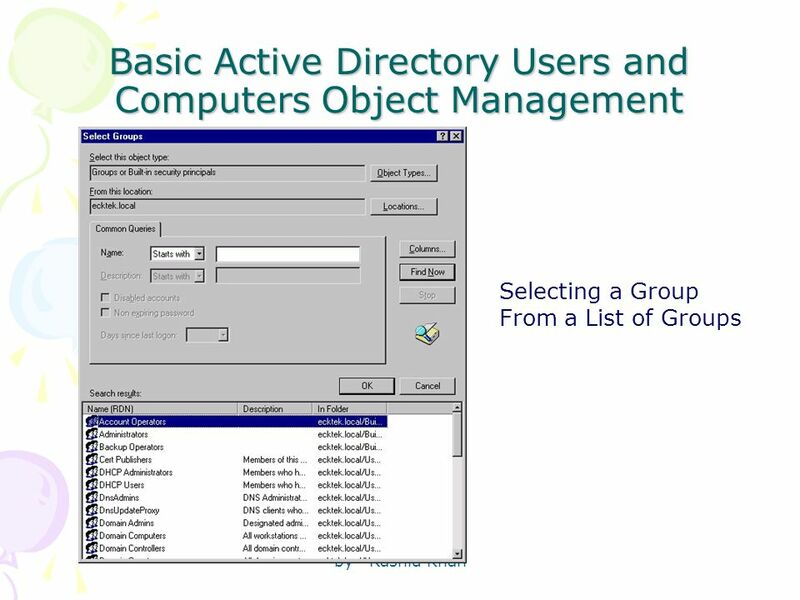 Exam Managing and Maintaining a Microsoft® Windows® Server 2003 Environment Lesson 7: Introducing Group Accounts. 11 WORKING WITH COMPUTER ACCOUNTS Chapter 8. 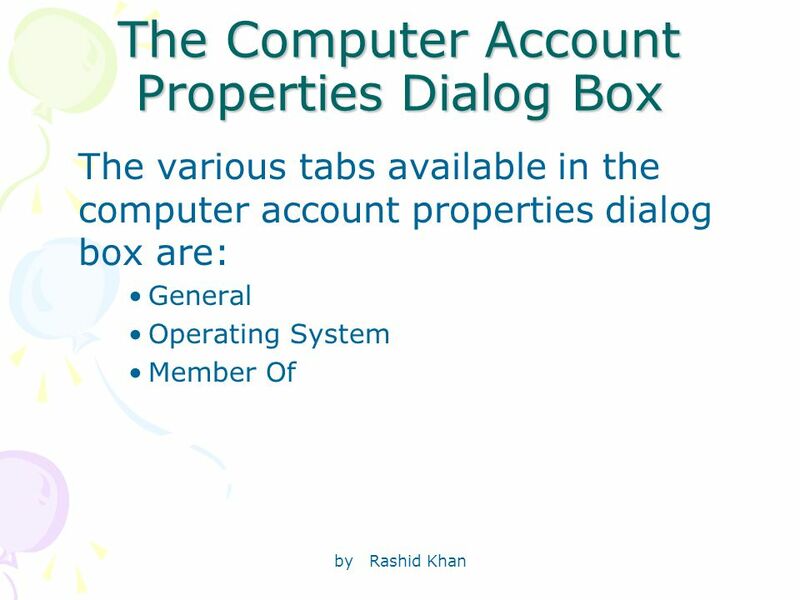 Chapter 8: WORKING WITH COMPUTER ACCOUNTS2 CHAPTER OVERVIEW  Describe the process of adding a computer to.